We’re writing this today with a sense of indignation and offense. We’re doing so today after having read the “Today in history” section of Argentine internet newspaper El Intransigente. Really, we don’t want to accuse this medium of anything but lack of journalistic rigor as they seem to have only referenced Wikipedia to try to explain the events of April 26, 1937. Franco knew nothing: What kind of supreme leader doesn’t know what his troops are doing, especially in an operation that meant the use of almost 30 tons of bombs. It’s inconceivable that he didn’t know and didn’t approve. The planes were trying to destroy a strategic bridge for the war march in the northern front: Renteria Bridge is a small structure, less than ten meters long, that is used to cross the tiny Oka River, which not long after becomes the Guernica Estuary. To believe that anyone needs 30 tons of bombs to destroy such a tiny target is to be an idiot, esepcially if we keep in mind that a large part of those bombs were incendiary devices which would have been useless against the stone bridge. The target was the city and its maximum destruction. 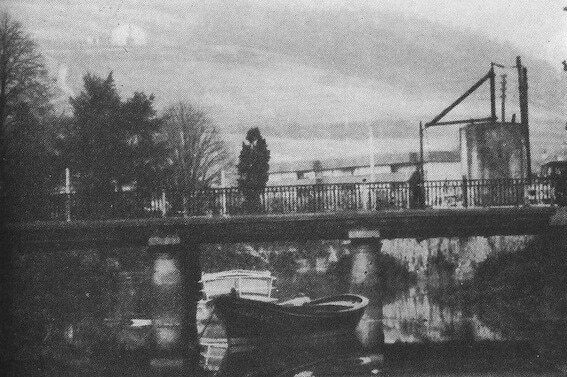 Image of Renteria Bridge at the time of the bombing. 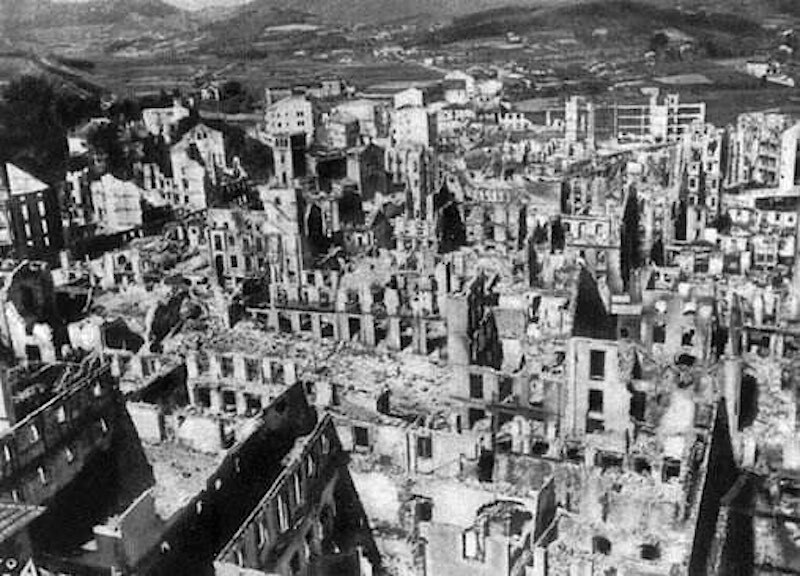 Guernica was a military target with important arms factories. The Germans and Italians at the service of the rebels led by Franco did not want to destroy the Guernica arms factories. 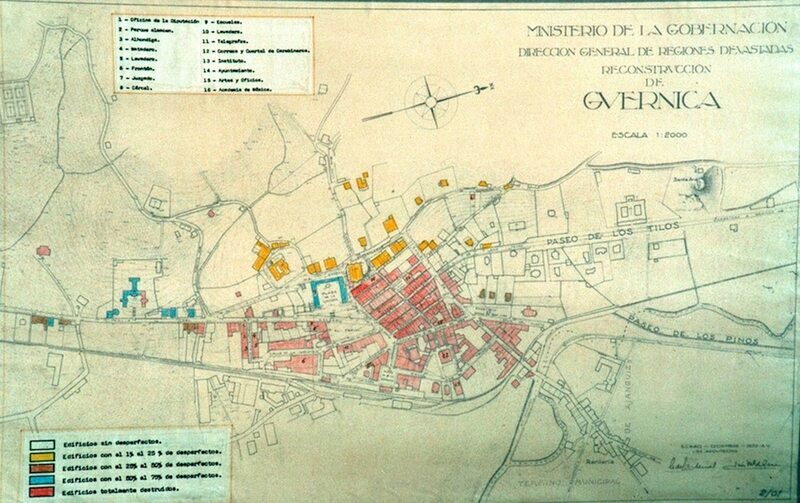 Franco’s troops knew that Guernica would fall in a matter of days and that these factories, owned by businessmen with fascist ideas, were going to help them win the war. Just like they left Bilbao’s heavy industry was left untouched, they had no intention of destroying any weapons factories. This point is driven home by the fact that they were well outside the area destroyed. It’s false that a civil population would be attacked. There was no military objective for the attack; it was to cause the most absolute destruction of the city, causing the highest possible number of civilian victims. The damage produced, as wellas the way the bombing took place and which bombs were used so show it. The market that day had been cancelled. According to revisionists, this is a key piece of information, because it would mean there were fewer people in Guernica that day and that this therefore proves there were hardly any victims. The market was suspended at noon, meaning that everyone who was going to attend was already there. This raised the city’s population quite a bit, as those attending the market were added to the refugees who were trying to get to Bilbao, the troops who were withdrawing, the injured in the field hospitals, and the population of the city itself. The city was completely destroyed because the firefighters took too long to arrive. Today, to drive from Bilbao to Guernica takes 40 minutes. Back then, getting there in two hours was a record. The firefighters got there as soon as they could, but the sheer magnitude of the damage made it impossible for them to act. Another incredible claim is that there wasn’t a fire station in Guernica because Basque nationalist leaders didn’t consider it necessary. The Basque Government controlled part of the Basque territory during the war, but undoubtedly their ability to create a fire station in every town in the country was well outside their possibilities. It could also be that they simply couldn’t have imagined such a vile and deadly attack as the one on Guernica or Durango. There weren’t as many dead as they say. We’ll never know, since, among other things, what the fascists did when occupying Guernica two days later was to burn all the archives at the local church to keep the total number of dead from being known. If the uprisen troops were good at anything, it was in digging common graves to bury all the dead; even today, a century later, there are still common graves that have yet to be found. If there were 336 deaths in the attack on Durango (which didn’t have any incendiary bombs), it can be supposed that the number of deaths would have been similar in Guernica. The only difference is that Durango didn’t fall to the fascists until a month later, which gave the Basque government time to count the dead–something that never happened in Guernica. The civilian population was not shot down. In both attacks, Guernica and Durango, the civilian population was shot at from the Condor Legion planes with machine guns; denying this is like claiming that Basque President Agirre ordered Guernica to be burned: a blatant lie. Really, we’re tired, offended, disgusted, and pissed off, especially because of this wave of revisionism about what happened at Guernica and in general by the intention of these heirs and followers of Francoism who would have us believe that this murderous, criminal, and illegal regime wasn’t that bad for those under it. Not only did we have to put up with being kidnapped the entire length of the dictatorship, now we also have to be thankful. One final thing, which is making the rounds lately, is that in the Spanish Civil War, the troops of the National Front were fighting against the troops of the Popular Front. NO. This is a lie. The troops of the Republic, the troops of the government, the legal government, that had been elected by its citizens, fought against the troops of a group of insurgent military men and their followers whose goal was to install a dictatorial regime, allied with other fascist and nazi governments of Europe. El de Guernica no fue el primer bombardeo en alfombra con el objetivo de destruir una ciudad, pues de hecho constituía un objetivo militar vital en ese momento (cortar la retirada y aprovisionamiento de las tropas del frente popular en la campaña de Vizcaya).